Israeli soldiers injured, Friday, sixteen Palestinians near the northern entrance of the al-Biereh city, in the Ramallah and al-Biereh governorate, in central West Bank. The soldiers attacked many Palestinian protesters, and fired dozens of live rounds, rubber-coated steel bullets, gas bombs and concussion grenades at them. 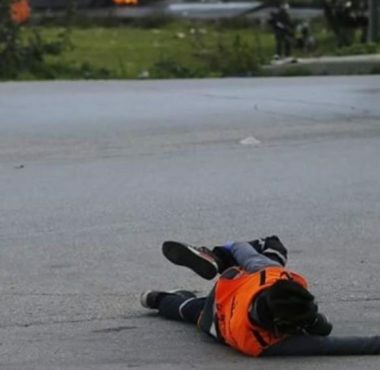 Medical sources said the soldiers shot three Palestinians, including a medic, with live fire, five others, including a journalist, with rubber-coated steel bullets, and caused eight to suffer the effects of teargas inhalation in addition to cuts and bruises. The wounded journalist has been identified as Najeeb ar-Razem. The soldiers also deliberately targeted medical teams and reporters in the area. In related news, the soldiers attacked Palestinian protesters in the al-Mughayer village, east of Ramallah, and fired many rubber-coated steel bullets and gas bombs at them. The soldiers also caused seven Palestinians to suffer the effects of teargas inhalation in al-Mazra’a al-Gharbiyya village, north of Ramallah, after the army resorted to the excessive use of force against nonviolent protesters, marching on Palestinian lands, Israel is trying to illegally confiscate for its colonialist activities. In Bethlehem, the soldiers attacked Palestinian protesters, who marched from the al-Azza refugee camp, north of the city, and fired gas bombs and concussion grenades at them.